The Z-NET Blueprint is the model that has been created for rural towns, villages and regions to be able to assess and design their Z-NET plan ~ to achieve the goal of 100% renewable energy and beyond. It sets out the approach taken, the logic and principles applied in assessing options and the framework used for developing the implementation plan. The original Z-NET Blueprint was funded by the NSW Office of Environment & Heritage and was created in partnership with the community of Uralla in NSW. This version is focused on zero-net energy. The Blueprint has since been significantly expanded as part of the Z-NET Hepburn Shire work. An updated Blueprint has now been created to also include electric transport and energy storage. This version is focused on zero-net emissions. The original Z-NET Blueprint was developed at the same time as creating a plan for Uralla ~ the Z-NET Case Study Town. This approach has given the model a very practical and ‘real world’ grounding, and includes a business case assessment to quantify the costs, benefits, opportunities and risks of the various options available. Creation of Uralla’s Plan was funded by the NSW Office of Environment & Heritage. Z-NET Uralla Blueprint is now available. The second of the Z-NET Blueprints has just been completed in Hepburn Shire. Their goal is more advanced and incorporates agriculture, buildings, electric transport and energy storage. The aim here is zero net emissions and is called Hepburn Shire Community Transition Plan. Details of Z-NET Hepburn are now available. Becoming a Z-NET requires a path that’s ambitious, realisable and in the long-term interests of each local community. To do this, it needs to be technically and practically feasible, financially viable and desirable to the local and wider community. The approach taken has been to carefully consider the context, identify all possible options and assess whether they will work and then resolve how they are best implemented. 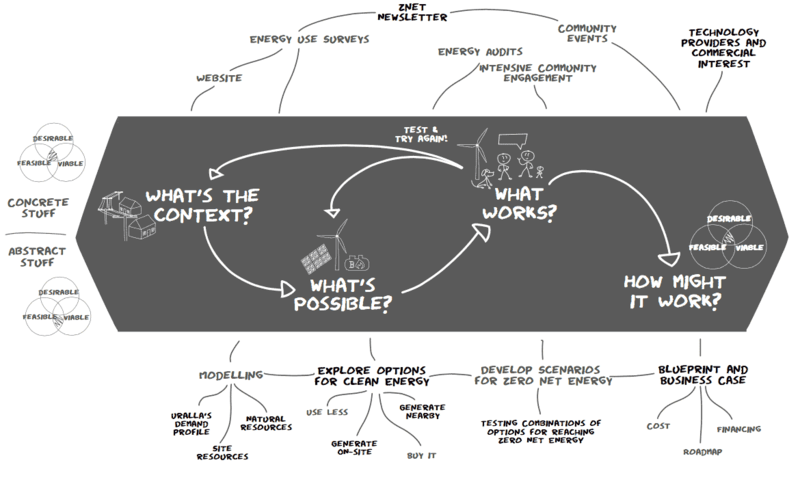 The first step is to understand the context, which includes identifying the characteristics of the location and the community and its existing energy use. The context defines current and future energy requirements, identifies opportunities and highlights issues that present limitations or risks. What’s possible and will it work? The next step is to understand all the possible options and determine the best fit within the local context. There are many options to reduce energy use and produce energy from renewable sources. To find the right approach we need to identify if options are feasible, viable and desirable. Having a model is great but it’s crucial to have a plan to ensure it gets done. Understanding who is responsible for what and being clear about the resource requirements are key to ensuring we have a practical and reasonable path to achieve the goal of becoming a Z-NET. The Blueprint and the Uralla Case Study are both useful resources for communities seeking to become a Z-NET. Follow the links below to see how the Blueprint was applied for Uralla. This will give you an sense of how Z-NET could work for your community. AND FINALLY, HOW MIGHT IT WORK? The below visualisation provides a walk-through of Uralla’s Z-NET Blueprint structure and the process of how it is created. At this time the visualisation includes the Uralla Case Study to highlight how Z-NET is applied in a practical sense. The context, options, preferences and plan for each town and village will be slightly different. The Z-NET Blueprint is designed to be adaptable to allow for this tailored approach.